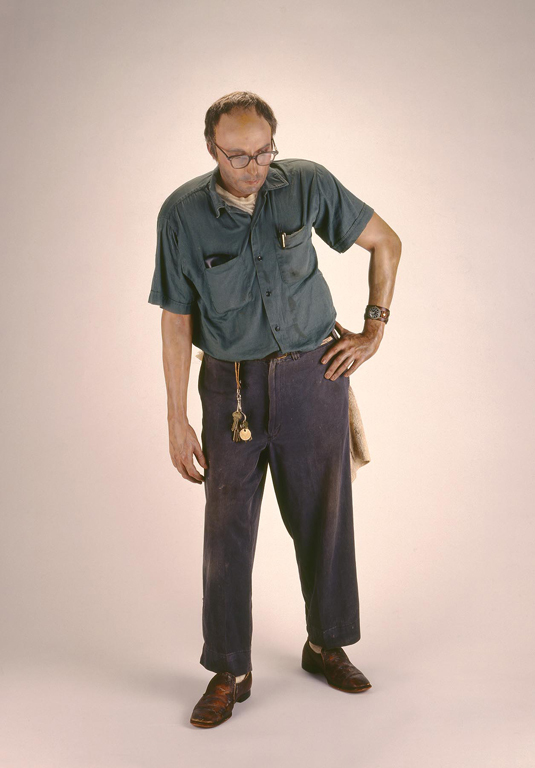 Duane Hanson’s lifelike Janitor (1973) is one of the Museum’s most beloved works of art. It generates curiosity on many levels: How did the artist make the sculpture so realistic? What does this photo-realistic artwork mean? What does he wear under his uniform? How does the Museum take care of this unusual work of art? To that final question, “carefully and creatively” is the answer that the Museum’s Docents recently learned from senior conservator Jim DeYoung. The Milwaukee Art Museum agreed to loan Janitor to the Walker Art Center for the Lifelike exhibition, Feb 25 – May 27, 2012. In preparation for the artwork’s exhibition in Minneapolis, Jim’s conservation team turned their restoration attention and considerable skills to making Janitor appear in pristine condition and ready for travel. The details of this restoration are fascinating. Curious about how a conservator cleans 40-year-old human hair affixed to plastic? Hint: They don’t use Head and Shoulders shampoo. Read on to find out more! First Jim explained to us how the overall condition of an artwork is taken in to consideration before it is approved for loan, or to travel. The condition affects how it will be displayed, how it will be packed for travel, and how it will be prepared for presentation. Janitor leaning secured to a paintings cart in the Museum conservation lab. Duane Hanson (American, 1925-1996), Janitor, 1973. Photo by Terri White. The janitor does not stand by himself; he has to always be leaning on something or braced. He’s an extremely fragile figure. Many contemporary materials are deceptively fragile, which seems non-intuitive because you usually think of plastic and so forth as unbreakable. The Janitor is made out of fiberglass resin, which gets very brittle with age. The body has a very delicate surface paint on it, and the janitor also has a lot of other additional aging materials (his clothing, the hair, his watch). We’ve known for quite a while that it was a priority for Terri White, the Museum’s objects conservator, to treat the janitor. However, with such nontraditional materials, our team needed to consult with other conservators who have gone down that path and worked on objects like this. That’s exactly what we did. Working with the expertise of objects conservator Mimi Leveque (Massachusetts), the Museum’s conservation team studied object files that contained letters with the artist, previous photographs of the object, and treatment and experience of other Duane Hanson sculptures in other Museum collections. Jim described how he and Terri approached cleaning the janitor’s clothing. While on view, Terri lightly vacuums Janitor frequently, but there still is a certain amount of dirt and grime settled in. The very first thing we had to do was address how or if to clean the janitor’s clothing. We thought that it might be possible to take his clothes off and throw them in the conservator’s version of a washing machine, but that’s not the case. We discovered that Duane Hanson constructed the Janitor so that his clothes cannot be removed. 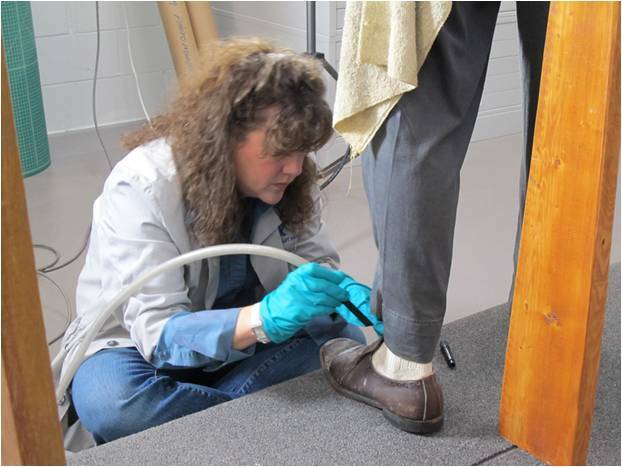 Objects conservator Terri White carefully vacuuming a sock and pant leg. Duane Hanson (American, 1925-1996), Janitor, 1973. Photo by Jim DeYoung. If you look at the way his hand is resting in his hip, you’ll see that the arm was probably attached to the shoulder after the clothes were put on. We would have to detach the arm if we wanted to take the clothes off. We even discussed the possibility of carefully cutting all of the clothing seams and then re-sewing them back on after cleaning, but that was determined to be way too invasive. In the end, we gave the entire sculpture a very gentle vacuuming with special consersation vacuums. Janitor’s hairline. Duane Hanson (American, 1925-1996), Janitor, 1973. Photo by Terri White. Jim shared that over the years, parts of Janitor’s outfit have sadly gone missing to the wandering hands of Museum visitors. Jim discussed the ethics of honoring the originality of the artwork as it currently exists, or honoring the intentions of the artist. For guidance, Jim and Terri turned to the words of the Duane Hanson himself. We found a letter written in 1974 from Duane Hanson and it demonstrates that he was very involved with the owners of his artwork in their care and maintenance of these artworks. We read that Hanson was not only involved himself, but that he was eager to get other people involved, too. 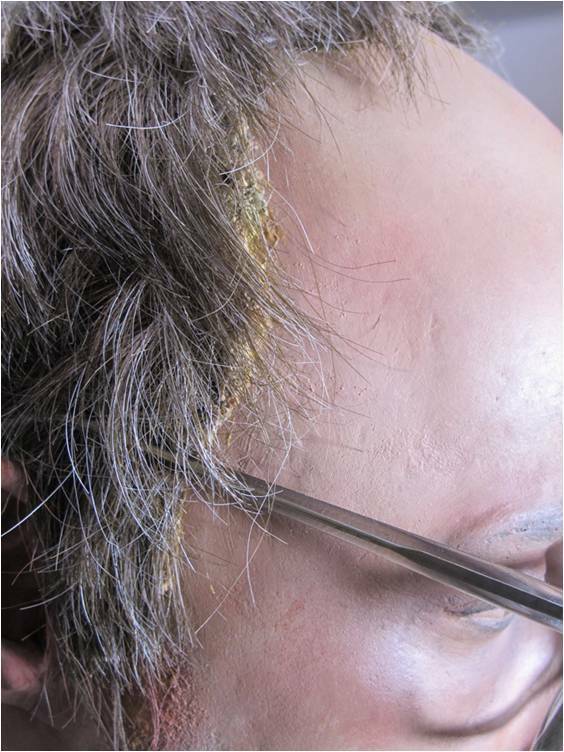 In this case, he had no problem packing human hair into the letter and instructing how to attach the hair with the gluing method and so forth. So this gave us a bit of a road map in what we thought was ethical to do to, how much latitude we had in caring for the artwork, and how much artistic license we had to move ahead with plans to bring the janitor to its original condition. Since the artist Duane Hanson is so longer with us to guide us specifically, we honored his will as expressed in the letters to let us make good decisions concerning the janitor. 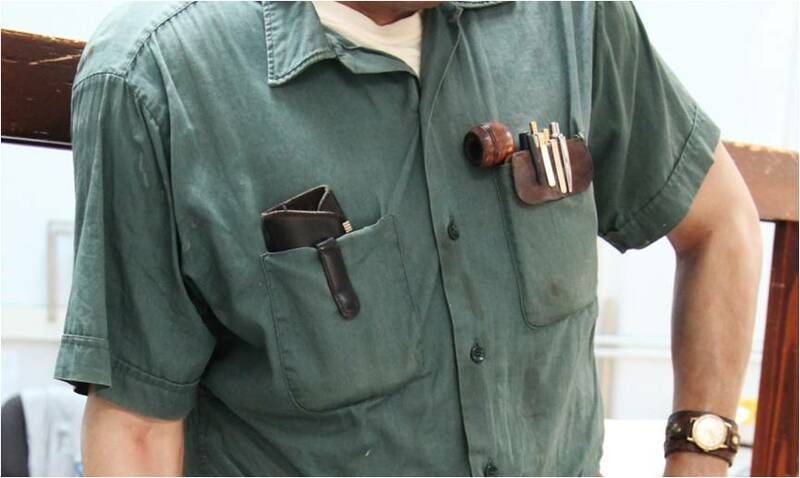 Detail of janitor pockets. Duane Hanson (American, 1925-1996), Janitor, 1973. Photo by Terri White. For instance, concerning the missing articles in the janitor’s pockets, Jim and Terri felt secure in following their own skills and instinct to find comparable materials to replace the thefted items. While Terri was doing some of the stabilization and treatment, my job was to go shopping. I pride myself as being a hunter/gatherer, so I hit most of the antique shops around Milwaukee looking for late 1960s style pipes, glass cases, and pens. Wrist watch before, during, and after restoration. Photos by Jim DeYoung. The restoration of the janitor’s watch was very interesting. The Museum Docents learned from Jim that this was one of the first bits of vandalism to the popular artwork. The original watch put on by Duane Hanson was removed sometime in the mid 1970s, before Jim joined the Museum staff 36 years ago. Over the years, various watches have been used by Museum conservation staff, but it was time to come up with a proper replacement to the best of the Museum’s restoration abilities. A black and white photo showed that the original was a white faced watch, so I went out to look for a watch and I found one similar at the Second Street Antique Mall to replace the pre-restoration black face watch. A watch expert looked at the serial number on the white watch from the Antique Mall and learned that the watch dated to 1969, so it would be an appropriate four-year-old watch for our 1973 Janitor. The new watch is actually an automatic, meaning it doesn’t run on batteries, but it does require movement which the Janitor can’t actually do. So, the watch is operable, but in the Museum most of the time it will be stopped unless somebody wants to wind it constantly. I don’t have any volunteers for that! The new watch was glued down to the existing leather, which is something we ideally would have replaced, but it is glued onto his arm and is disintegrating. Terri worked to reconstruct part of that band, but by far the hardest part was finding a replacement snap. There I was looking at Goodwill second hand shops searching through bins filled with 1960s, 70s, and 80s purses. I was drawing a lot of strange looks as I furtively looked for a specific type of snap. Finally there was a handbag with a matching purse inside with the exact same snap as the janitor’s watch. The purse was Pepto-Bismol pink! I swallowed my pride and walked up to the front with my pink purse, trying to figure out whether or not I should try to explain myself to the cashier. 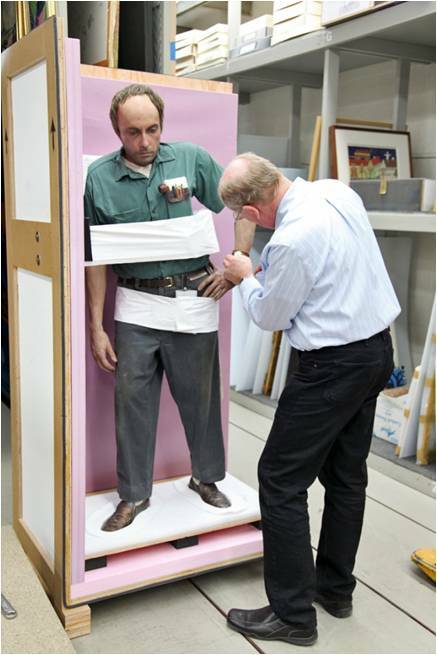 Museum senior conservator Jim DeYoung with the janitor, while fabricating its shipping crate. Duane Hanson (American, 1925-1996), Janitor, 1973. Photo by Terri White. Jim further explained to the Docents how the conservation team works with the crate assembly technicians to devise the safest orientation for moving the Janitor. 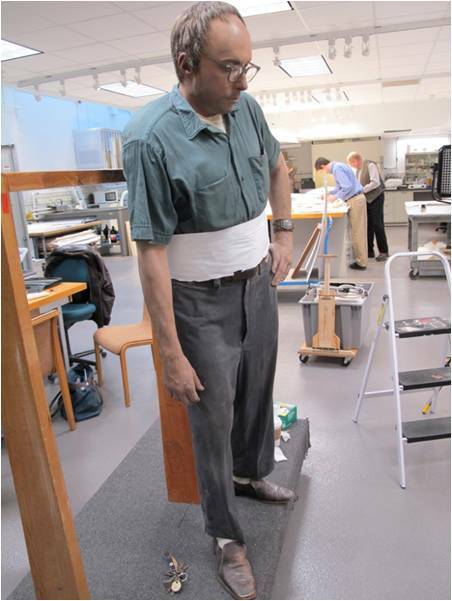 For instance, laying the Janitor down on a soft bed was decided to affect too many stress points, so they traveled the sculpture “standing” [as you can see at right] and carefully decided where to anchor soft braces to keep the body upright in the crate. Museum staff traveled with Janitor and oversaw the installation in the galleries at the Walker Art Center. Jim ended by explaining in a great way how all these efforts are very detailed to a great end. Sometimes we do our jobs best at the Museum when you can’t tell we’ve been there at all. We make the paintings seem to magically and beautifully appear on the gallery wall, and we keep the Janitor looking as if it was 1973. These are all minor details, but it is amazing how when it’s all assembled and in part of your mind you say “it looks the same.” But, in a way, I feel that the artwork is more intact. To me as a conservator, it is important to have an object not look neglected or look aged or worn. I think in this restoration of Janitor we have that sense of what Duane Hansen intended and I think he actually looks a little happier. Janitor will be on view in Minneapolis at the Walker Art Center until May 27, 2012. He will then ship carefully back to Milwaukee, and the art installation team will be putting him back in the Museum galleries as soon as possible. Expect our favorite loafing custodian to be back leaning against his wall by July 2012! This entry was posted in Art, Behind the Scenes, Curatorial and tagged 20th century art, conservation, Contemporary Art, Duane Hanson, Janitor, sculpture, Walker Art Center. Bookmark the permalink. Oops! Thanks for catching my typo, Graham. Fixed now! Mel–I live in Chicago and we have an original Hanson (a plumber) from 1977. It needs conservation (just the effects of time), and I was wondering if you can recommend conservators or if this is something your team can be can be engaged to do. Seeing what you have done is fascinating, so thanks for sharing it.